A permanent tribute to the Young Money founder is revealed. When it comes to tattoos, Drake likes to pay tribute to his heroes. He has multiple Sade-related inkings alongside pictures of his parents, Aaliyah, and even the BBK logo. There's also a shark on his arm, a reminder of good times with Rihanna. It seems that Drake is keeping up the theme with his latest tat, a large portrait of Lil Wayne on his upper left arm. 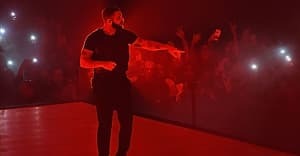 The first pictures of the ink were revealed on Drake's Instagram overnight, as he shared a picture from the Houston Appreciation Week celebrations. The image of Wayne, a man covered in tattoos himself, is located near a skull and a Drakkar Noir bottle on Drake's bicep. As the man who signed him to Young Money in 2009 and kickstarted a career, it's easy to see why Drake would want to have a permanent reminder of Wayne next to him at all times. Check out the original image that inspired the ink below.